JTable cell Color: How to color your JTable individual cell background. Here I am going to share with you a little solution by which you can color the background of individual JTable cell. 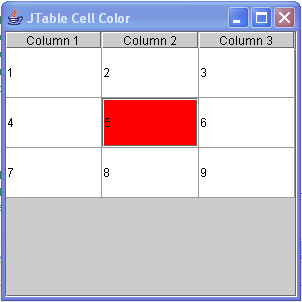 In the following code I colored the cell’s background in click event i.e when you will click on the JTable Cell the background of that cell will be red. This solution is just to give you a basic idea; you can modify it as your own. The code is given below. Next postRecruitment Examination English Section: Fill in the blanks with articles and others.